This wonderful book combines two of my favorite things: a song as a book and woodcut illustrations. I loved teaching my students the traditional song of Thanksgiving with this book every November. The pictures wonderfully illustrate all three verses of the original poem by Lydia Maria Child (which references activities and uses words unfamiliar to many children). Another book that uses the same song as text is called Over the River: A Turkey's Tale . A very differently (more cartoonish) illustrated book that might appeal more to some children, it uses pictures to tell a silly tale about turkeys escaping disaster to have their own feast. With poetic text and lovely painted illustrations, this book explores changes in the natural world during November. At the end author Cynthia Rylant seamlessly transitions from animals seeking warmth to family and friends gathering in a cozy home for Thanksgiving. I love how this book ties together the seasonal changes with the celebration of the holiday. Count up to 10 with a large family as they prepare for and eat Thanksgiving dinner. I love Falwell's cut paper collage illustrations and the simple text and counting theme make this perfect for young ones. Her picture book Christmas for 10 is a favorite Christmas book as well. November is also a great time to read Falwell's Gobble, Gobble , all about wild turkeys. This story begins "It was nice in our village. Till the night in October when the soldiers came." It tells the story of a family fleeing its native country in a small boat and arriving in America on Thanksgiving Day. I loved reading this story to my students, almost all immigrants, some of whom had come to America after fleeing violence in their own countries. I often teared up at the end of this poignant tale by Eve Bunting. Note that while this book contains more sensitive subject matter, there is nothing graphic or disturbing depicted, and all the family arrives in America alive and well. This beautifully illustrated book features a text based on Saint Francis of Assisi's Canticle of the Creatures ("reimagined" by Katherine Paterson). A translation of the original canticle text is included at the end. I think this text could be appreciated by those of many belief systems as the hymn praises and thanks "God" and "Lord" for "Sister Moon," "Brother Earth," etc., and not a specifically Christian God. I was drawn to this book for its profound and uplifting expression of gratitude and actually purchased it for myself, but my children have really enjoyed the lyrical text and detailed illustrations. Can lead to deep discussions as it addresses hardship and expresses gratitude even for "Sister Death." The text of this book by Chief Jake Swamp is based on the Iroquois' Thanksgiving Address: "an ancient message of peace and appreciation of Mother Earth and all her inhabitants." A beautiful expression of gratitude for the bounties and delights of the natural world. This and the previous title are perfect for exploring the idea of gratitude any time of the year. Gail Gibbons is one of my favorite non-fiction picture book authors for children, and in this book she covers the traditions of harvest festivals through time with a focus on the present Thanksgiving Day. This book has limited text (and repetitive sentence structure) with detailed illustrations, making it a great title for both young and older children. 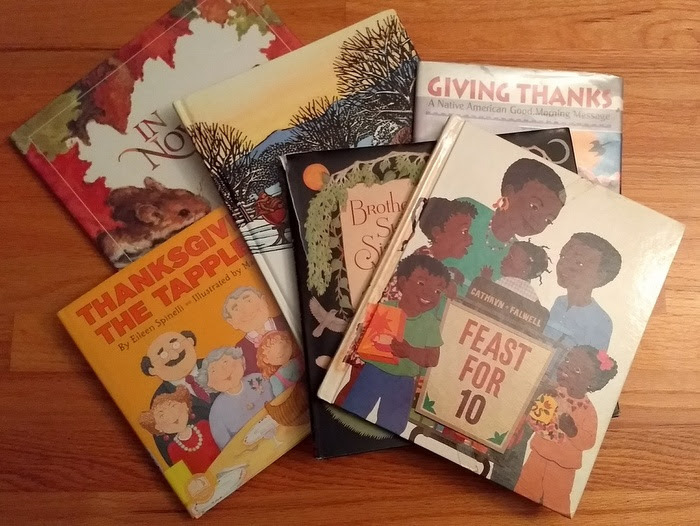 For some picture books for older kids about Thanksgiving that are chock-full of historical information also check out If You Sailed on the Mayflower in 1620 (my kids love the Q&A format of this series) or Thanksgiving on Plymouth Plantation (Time-Traveling Twins) , which reminds me of The Magic School Bus because conversational bubbles provide lots of snippets of additional interesting information in addition to the regular text. After burning their own Thanksgiving dinner, an elderly couple wanders in the door of a restaurant, where they unexpectedly interrupt an immigrant family celebrating their own Thanksgiving dinner. The elderly couple are welcomed by the grandmother as honored guests and invited to participate in the family's meal and celebrations. A lovely message about the spirit of Thanksgiving. A humorous story that emphasizes the importance of family over food at Thanksgiving. There is a second version of this same text with a different set of illustrations (where the family is wolves), but my kids prefer this one. Not exactly a Thanksgiving story, but such a wonderful book that I'm including it anyway. I found the story of the man who created the incredible giant balloons for the Macy's Thanksgiving Day Parade both fascinating and inspiring, even though I'm not a particular fan of the parade. A must-read if you watch the parade with your kids (and a fantastic read even if, like me, you usually don't). What is your favorite Thanksgiving story?